Key indictments, guilty pleas, convictions and sentencings. WASHINGTON — The Russia investigation has provided a barrage of headlines, court cases, tweets and speculation since before the last presidential election. Despite the clamor, several key events stand out. Here are the milestones that have shaped the investigation — and rattled the White House. Former FBI Director Robert S. Mueller III is appointed as special counsel by Deputy Attorney General Rod Rosenstein, who is overseeing the Russia investigation because Attorney General Jeff Sessions recused himself. Mueller takes over days after President Donald Trump fired James B. Comey as FBI director, raising concerns that a fair investigation of his campaign’s alleged ties to Russia would be impossible without an independent prosecutor. At this point, the probe has already been underway for nearly a year, starting as a counterintelligence investigation during the 2016 campaign. Mueller makes his first public move, obtaining indictments against Paul Manafort and Rick Gates, the former chairman and deputy chairman of Trump’s presidential campaign, respectively. They’re charged with money laundering, tax evasion and other crimes related to their work for Ukraine’s pro-Russia government. Mueller also releases a guilty plea from George Papadopoulos, a former low-level foreign policy adviser to Trump’s campaign, who admitted to lying about his overseas contacts. He is later sentenced to 14 days in prison. Michael T. Flynn, Trump’s former national security adviser, pleads guilty to lying to the FBI about his conversations with the Russian ambassador in Washington during the presidential transition. Flynn and the ambassador discussed sanctions imposed by the Obama administration in retaliation for Russia’s election interference. The retired Army lieutenant general agrees to help prosecutors. Thirteen Russians are indicted for allegedly interfering in the 2016 campaign with stolen identities, fake campaign events and social media accounts. Mueller also charges three Russian companies, including the St. Petersburg-based Internet Research Agency, which is described as a Kremlin-connected “troll factory.” The indictments do not include any allegations that Trump aides were involved with the operation, but a California man, Richard Pinedo, pleads guilty to identity theft for selling information to Russians. He is later sentenced to six months in prison. Alex van der Zwaan, a former London-based Dutch lawyer at a prominent law firm, pleads guilty to lying to federal agents about his work with Manafort and Gates on a controversial report. The report was used to defend the former pro-Russia government of Ukraine against accusations that it had improperly prosecuted a political opponent. Van der Zwaan is deported in June after he serves 30 days in prison. Gates pleads guilty to charges of conspiracy and lying to federal agents, and he agrees to cooperate with the special counsel’s office. Prosecutors file additional charges against Manafort for alleged bank fraud and undisclosed lobbying on behalf of a foreign entity. Manafort faces two federal trials, one in northern Virginia and one in Washington, D.C.
A federal judge orders Manafort jailed for violating his bail by contacting and seeking to coach potential witnesses in his case. Manafort is also indicted on additional charges of obstruction of justice and conspiracy to obstruct. His business colleague in Ukraine, Konstantin Kilimnik, who prosecutors claim has ties to Russian intelligence, is indicted on the same charges. Twelve Russian military intelligence officers are indicted for allegedly penetrating and ransacking Democratic National Committee computer networks during the 2016 campaign, part of Moscow’s covert effort to boost Trump’s candidacy. One batch of hacked emails was released shortly before the Democratic National Convention, and thousands more stolen from Hillary Clinton’s campaign chairman were dumped the month before the election. A federal jury in Virginia convicts Manafort of eight counts of tax evasion and bank fraud. 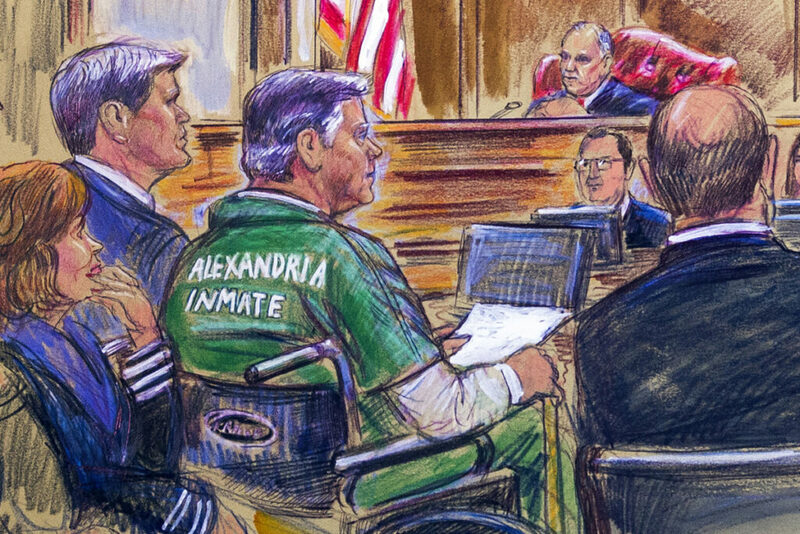 Gates testified against Manafort during the 12-day trial. On the same day in New York, Cohen pleads guilty to several charges, including campaign finance violations for arranging hush-money payments to two women who said they had sexual affairs with Trump. Cohen told the court that Trump directed the scheme, directly implicating the president in a felony. Manafort pleads guilty to two conspiracy charges to avoid a second federal trial in Washington on more charges related to his work in Ukraine. He agrees to cooperate with the special counsel’s office. The day after Democratic victories in the midterm elections, Trump pushes out Sessions as U.S. attorney general and names Matthew Whitaker, previously Sessions’ chief of staff, as a temporary replacement. Officials say Whitaker will supervise Mueller’s investigation, raising alarms because he was a sharp critic of the probe before he joined the Justice Department in 2017. The president’s legal team says it has submitted written answers to some questions from Mueller. The questions all focused on events before the 2016 election, meaning they centered on potential conspiracy with the Kremlin-backed operation, rather than possible obstruction of justice after Trump took office. Cohen pleads guilty for a second time, confessing that he lied to Congress about pursuing a potentially lucrative Trump Tower deal in Moscow on Trump’s behalf during the 2016 campaign. As part of his plea deal, he admits to seeking the deal until Trump had clinched the Republican presidential nomination in June 2016, talking to a Kremlin office about the proposed project and briefing Trump multiple times on his progress. A federal judge said Cohen was “motivated by personal gain and ambition” when he committed his crimes and sentences him to three years in prison “to reflect the seriousness of the offenses.” He is scheduled to report to prison on May 6. A federal judge harshly criticized Flynn at a hearing where he was supposed to be sentenced, telling him “arguably, you sold your country out!” Flynn’s sentencing was postponed as he continues to cooperate with the prosecution of his former business associates for undisclosed lobbying on behalf of Turkey. The longtime Trump political adviser is arrested at his Florida home by heavily armed federal agents. Stone is indicted for allegedly lying to the House Intelligence Committee about his conversations involving WikiLeaks, the organization that released thousands of hacked Democratic Party emails during the campaign. He pleads not guilty. Months after prosecutors accused Manafort of breaching his plea deal by lying to them, a federal judge in Washington agrees. The decision makes it more likely that Manafort will face a steeper prison sentence because he won’t get credit for cooperating. House Democrats arrange for Cohen to testify at a public hearing about his decade working as Trump’s lawyer and fixer. Along with withering criticism of Trump, Cohen brings a copy of a $35,000 check, signed by the president, that Cohen said was partial repayment for an illegal hush-money scheme that kept Trump’s alleged affairs buried before the election. Cohen also suggests that Trump might be involved in insurance or bank fraud, and he said federal prosecutors in Manhattan are investigating his last conversation with the president or his representatives. Manafort is sentenced twice, first in Virginia, where he was convicted of financial crimes, and next in Washington, D.C., where he pleaded guilty to conspiracy charges to avoid a second trial. The judge in Virginia sentences Manafort to nearly four years in prison, while the judge in Washington gave him another three and a half years. Because Manafort has already spent nine months behind bars, the sentences mean he’ll be in prison for an additional seven years. The special counsel reached a milestone by filing his report with the Justice Department. It will be up to Attorney General William P. Barr to decide how much of Mueller’s findings are provided to Congress and made public.